The story of what was to become Hawaii Railway Co. #5 began in 1925 at the Baldwin Locomotive Works. 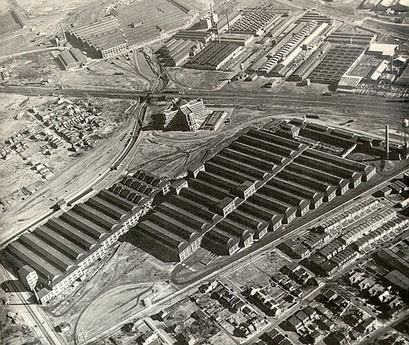 What was to become the Baldwin Locomotive Works, got its start in 1825 with Matthias W. Baldwin in Philadelphia, Pennsylvania. Mr. Baldwin was a jeweller and silversmith by training, who started into the world of steam engineering by designing and building an excellent small stationary engine for his own use. This engine was well made and efficient, so word spread and soon Matthias was receiving orders for additional steam engines to be built. In the early 1830's, Mr. Baldwin had seen and made construction notes of an imported English "John Bull" locomotive, and from this and his previous stationary engine experience, set to designing his own unique locomotive, founding the Baldwin Locomotive Works in 1831. Building a locomotive in the early 1830's was no small undertaking. None of the modern large scale machine tools yet existed, and so some very crude tooling had to be first designed, built and tested before construction of his locomotive could commence. In 1832 Matthias Baldwin's first locomotive christened "Old Ironsides" was completed and spent the next 20 years in active service. From this humble beginning, the company grew over the years with Baldwin taking on partners from time to time to get him through hard economic periods. Eventually, the Philedelphia shop was outgrown and the company began moving its manufacturing facilities to a much larger shop in Eddystone, PA starting in 1906. The Baldwin Co. was an eventual victim of over-expansion and advancing technology. Following World War I, Baldwin saw a decline in steam engine sales as the diesel engine became the mainstay on American railroads. Large locomotive companies such as Baldwin found it difficult to re-tool to embrace new technologies, and attempted to continue their committment to steam. The handwriting was on the wall, however, and diesel and diesel/electric engines rapidly supplanted steam on the nation's railways. The Baldwin Works made a late jump into diesel technology in 1929, but given the fact that this coincided with the Great Depression, the Baldwin Co. was forced into bankruptcy in 1935. The Baldwin Locomotive Works emerged from bankruptcy in 1938, and by 1939, presented its line of diesel locomotives to the railroad industry. It was too late. Baldwin had lost most of its customers to upstart diesel manufacturers EMD and ALCO, during its re-organization, and would never really compete. Baldwin continued to make steam locomotives, but between 1940 and 1948, domestic steam locomotive sales declined from 30% to 2% of the market. 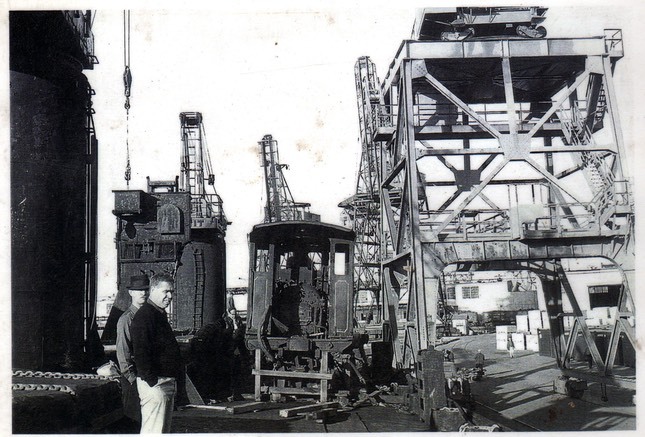 Baldwin stopped production of locomotives in 1956 to concentrate on production of heavy construction equipment. After a series of mergers, nothing could seem to forestall the inevitable, and in 1972, the last vestage of Baldwin ceased operations. History of the Hawaii Railway Co. The Hawaii Railroad Co. was formed in 1880 on the "Big Island" to link the sugar cane plantations in the North Kohala District to the Port of Mahukona. On January 10,1883, the 3 foot gauge railroad was completed as only the second common carrier in the Kingdom of Hawaii. 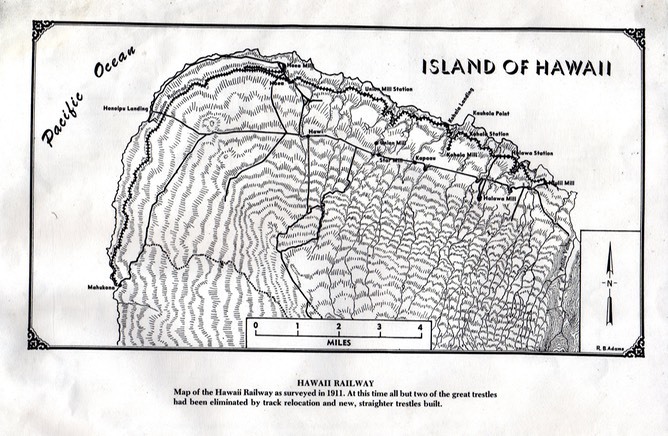 The line was just short of 20 miles long and ran along the North and West shores of the Island of Hawaii. The Hawaii Railroad Company was disincorporated in 1897 to become the Hawaii Railway Co. (A reincorporation in 1937 renamed the railway as the Mahukona Terminals Ltd). In 1906, a number of changes resulted when over a half mile of track was cut by relocation and rebuilding of a number of bridges and trestles. Improvements continued until the "Big Year" of 1937 when the Kohala Sugar Co. laid spur tracks to the mills and their corresponding fields. 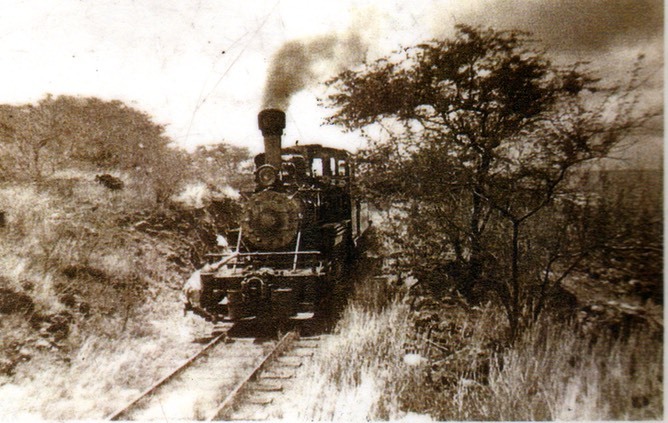 This marked the first physical connection of the railroad to the sugar cane operations. Previously, trucks hauled the raw cane to the mills where the sugar cane was processed and put in sacks which were then loaded onto trains. The new operational format lasted less than 10 years as a result of the closing of the terminal port of Mahukona during World War II, spurred by fears that Japanese subs might attack vessels in the small harbor. Following the war, trucks became the prime mover of sugar, thus dooming the Hawaii Railway Co. The Locomotives of the Hawaii Railway Co. Although first served by a number of industrial engines, the mainstays of the Hawaii Railway were its 2-4-2's (a reference to a locomotive's wheel arrangement, i.e., 2 wheels on the leading truck, 4 drive wheels, and 2 wheels on the trailing truck). In 1883, the railway purchased a 2-4-2 locomotive from the Baldwin Locomotive Works. Named the "Kauka", it set the precedent for the Railway's use of the 2-4-2 type of locomotive. All subsequent road engines would be 2-4-2's which were purchased in 1900, 1912, and 1925. The engines grew from 27,000 lbs to 37,300 lbs but all utilized 36 inch driver wheels and 14 inch strokes in the drive cylinders. The locomotives of the Hawaii Railway were initially coal-fired, but Bunker C (#6) oil became the fuel of choice in 1917. Each engine until #5 had a name, with #2 being named "Kauka", which is Hawaiian for Doctor, a nickname given to Gerrit P. Wilder, a son of the line's president. This locomotive was scrapped about the time of the arrival of #5. Locomotive #3, purchased from Dickson in Scranton, PA, was built in 1900 and named "Myrtle". It received a new Baldwin boiler in 1918. Although retired by 1945, this engine inspired the name and design of a locomotive now in service on the Lahaina, Kaanapali, and Pacific Railroad. Locomotive #4, of the Hawaii Railway was built by Baldwin in 1912 and named "Hawaii". It was retired by 1945. Locomotive #5 arrived in 1925. 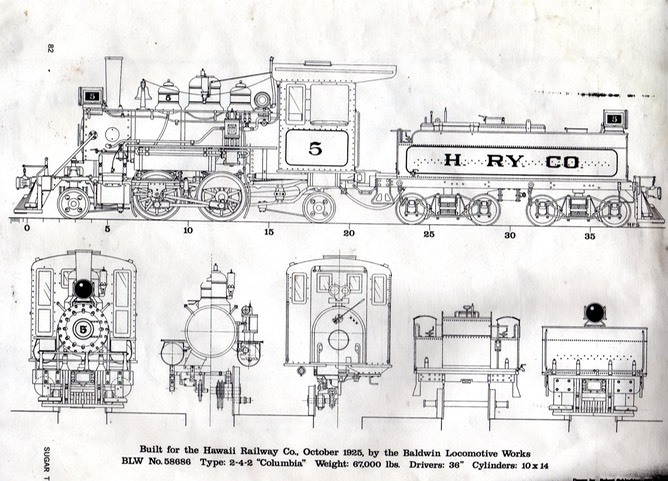 In 1925, The Hawaii Railway Co. purchased #5 from the Baldwin Locomotive Works in Philadelphia. The locomotive was financed by a successful increase in freight rates as well as higher quantities of sugar shipments. Hawaii #5 cost $11,901.25 new, when a Ford Model "T" of the same vintage sold for $290. Hawaii #5 was purchased from the factory as an oil-burner. It burned Bunker C (#6) oil which was the heavy black oil used in many ship's boilers of the day. This fuel was much easier to find in Hawai than either coal or wood. Number 5 served the Hawaii Railway until the end of World War II when the line went fully out of service. With minimal use between 1941 and 1945, the engine did not even have two full decades worth of wear and was thus retired with the potential of being run elsewhere. Being the newest and largest engine on the railway, the locomotive was set aside for a museum then being planned by Norman Clark. As the engine wasted away, waiting for a museum that was never to be, it carried with it various homemade parts not present when the locomotive was first built. Among such items are a footboard in place of a pilot (better known as a "cowcatcher"). Buckets of sand were placed on the footboard and workers, grabbing a frame support bar with one hand, would sprinkle sand on the rails with the other. The presence of this modification, combined with a later discovery of a bend in the front of the frame, and a new lead truck wheel set, are signs of a wreck that damaged the original pilot beyond repair. A 1941 photo shows that a cylindrical spark arrestor once graced the top of the smoke stack. Although oil fired, sparks and hot particles could still be emitted, risking setting the cane fields ablaze. As the engine sat in Honolulu, various parts, especially brass, were taken from the engine. Even the tender was separated from the engine, winding up in Antelope, CA. After being noticed by airline pilot and railfan author Jay Conde in the 1960s, Hawaii #5 was brought to the attention of Bob Keller, a mechanical engineer at Stanford University. 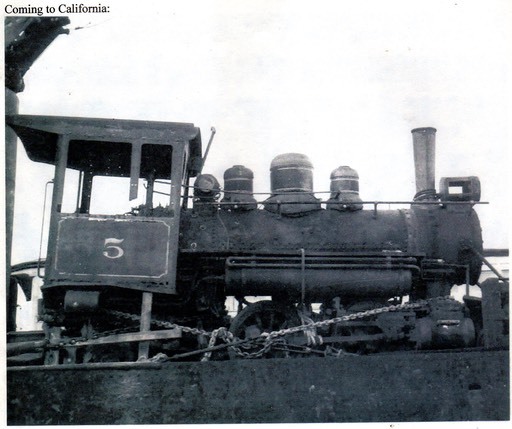 The locomotive was purchased by Mr. Keller and shipped to his home in California. There he began the restoration of the engine, even performing some of the work at the University's shop. In the five years he spent restoring the engine, he had a new boiler fabricated by Ocean Shore Iron Works in San Francisco. Although built to the same dimensions as the original riveted boiler, the welded replacement was ASME certified. The engine had been re-united with it's tender, but the tender needed a new water tank. A welded water tank was fabricated by volunteer John Greco as it was missing, but the original wheels, trucks, frame and riveted oil bunker were present and reusable. The initial steam-up of the new boiler took place in April 1970 in Alviso, CA. Later that year the locomotive would complete reassembly, would be operated on the Tahoe, Trout Creek & Pacific Railroad at South Lake Tahoe, CA. This operation utilized a new right of way and was operated by Keller's Scenic Railways, Inc. This railroad lasted only about a year, when Keller's Scenic was chosen to operate the Cumbres & Toltec Scenic Railway in Chama, NM. The locomotive followed Keller to New Mexico since that operation offered a safe storage location. Eventually, Hawaii #5 was sold to Shorelands Corp. near San Francisco. In 1991, the locomotive came into the possession of Southwest Leasing Corp. (Los Angeles) as collateral against a defunct loan of Shorelands. As the locomotive and tender were being trucked through Los Angeles, Dr. Richard May received a call from a friend who said "a steam locomotive is going down Olympic Boulevard!" After chasing down the locomotive, Dr. May spoke to the truck driver when the rig arrived at Southwest Leasing and obtained the phone number of the new owner. Some time later, Dr. May managed to purchase the locomotive. With yet another new owner, Hawaii #5 once again found itself headed for a new location. The locomotive ended up in the shop of Brook Rother in Georgetown, CA. 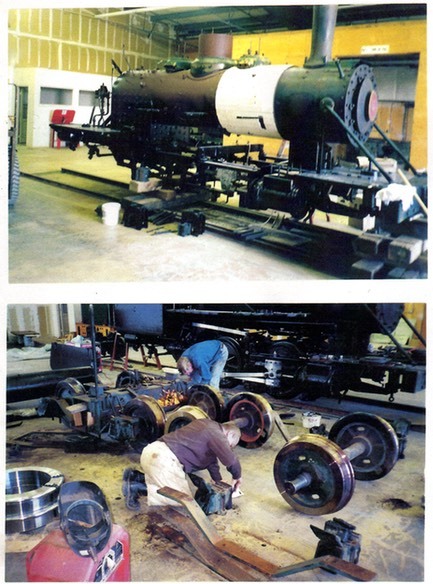 In 1999, the locomotive began a three-plus month restoration in preparation for a visit to Railfair at the California State Railroad Museum. In order to refurbish the locomotive, it was completely disassembled. While apart, the locomotive had its rear set of drivers reversed so that the right and left (R & L) stamps on the axles would match their respective orientations. The previous restoration saw this wheel set installed backwards. Since the eccentrics are driven from its axle, the locomotive ran in the direction opposite to what the direction of the Johnson bar. This was corrected during the initial restoration by reversing the eccentric rods. Machine work was done to the lead truck and new tires were fitted to it, as well as the tender trucks. The boiler was ultrasounded and approved for 165 lbs steam pressure (factory spec). Missing parts such as the steam and air pressure gauges, bell, three-note whistle, headlight, turbogenerator, and Detroit Lubricator were all replaced at this time. All new wood work was installed in the cab, as this wood had to be removed and fumigated to prevent termite transmission from Hawaii during shipment. With the restoration practically complete, the locomotive was trucked to Railfair in Sacramento. It operated there along side other narrow gauge locomotives. From there it made an appearance in Ardenwood Park in Newark, CA on Memorial Day of 2000. By the Fourth of July that year, it travelled to Carson City, Nevada for a steam event at the Nevada State Railroad Museum. While there, it ran briefly alongside the famous standard gauge Virginia and Truckee engines like the Inyo, as well as Nevada icons such as the Eureka. (Thanks, to Mike Piersa and Richard May for providing the main elements of this story). At the close of the Nevada event, the locomotive was not sent back west to California, but east to Connecticut. Before owning Hawaii Railway #5, Dr. May owned an Argent Lumber Co. 2-8-0 which he had obtained from the Edaville Railroad. 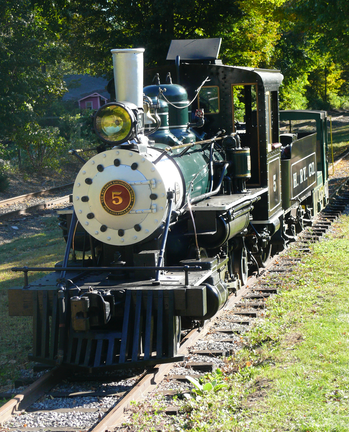 Originally planning to have it restored in Connecticut, he wound up selling it to the Connecticut Antique Machinery Association when it became clear that the Argent Lumber #4 locomotive needed more repairs than an individual could justify. In August of 2000, CAMA offered to pay for Hawaii #5 to be trucked to Connecticut, in order to operate the engine for their annual steam events, entering into a temporary loan agreement with Dr. May. In September, 2000 Hawaii #5 made its first trip under steam on the East Coast. Since that time, a new engine house was erected specifically to protect Hawaii #5, and a number of improvements and replacements were carried out to both the locomotive and the tender at CAMA's expense, as part of the loan agreement. In mid-2010, Dr. May and CAMA entered negotiations to transfer ownership of Hawaii #5. After an intensive fund-raising campaign, the CT Antique Machinery Association purchased #5 making Kent, CT it's permanent home. CAMA steams up Hawaii #5 during it's Spring and Fall shows and runs it back and forth for the enjoyment of 1000's of show attendees each year.